My parents are in the process of building a new house and while I was home a couple of weeks ago we thought we would get a head start on making over a few of their furniture pieces. 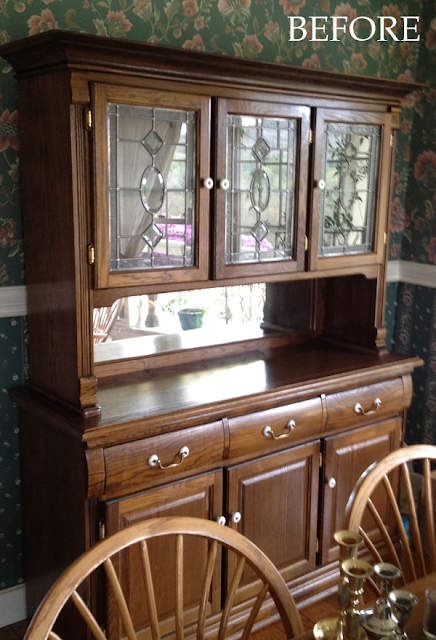 We redid the hutch and their dining room table. I will show you them both in full once they are in their new house and I can properly take "after" photos. For now, though, I thought I would at least share some close up shots of the hutch. I didn't take any full after shots because everything that was in here had been packed up so it isn't really styled. I just grabbed a few basic dishes and tulips from the kitchen and put them behind one of the doors to at least get a feel for what it will look like in a couple more months once it is in it's new home! To start with it was a typical 90's hutch. There was nothing wrong with it but it doesn't go with the feel that their new house has. I was not a fan of either the glass doors on the upper doors or the mirror so those were the first to go. Lucky for us the glass came out easy as could be. Then we took off the knobs and started painting. 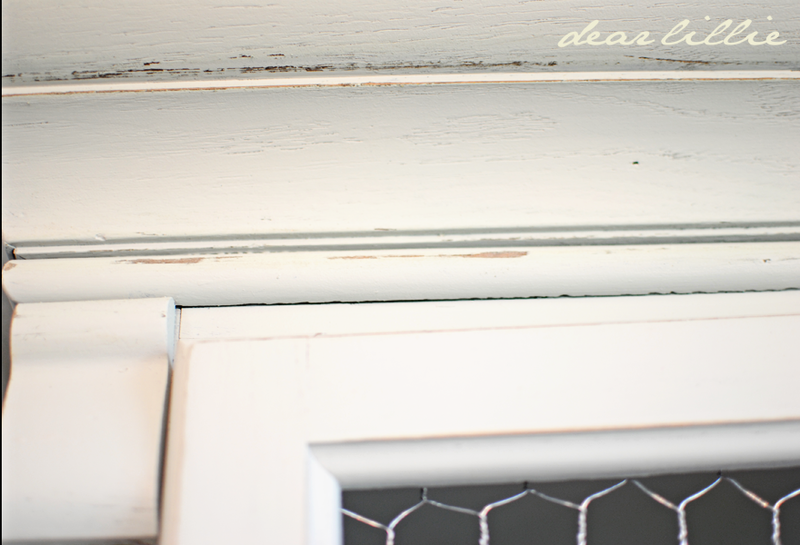 We used Benjamin Moore's Sea Haze for this and LOVE the color. For this piece we didn't need to sand or prime or anything. We just painted it on. Along with painting all the wood we also painted right over the mirror! We did two coats and then once it was dry took some sandpaper and sanded it down to give it more of a vintage look. We also rubbed some wax on it to help protect the top part of it. 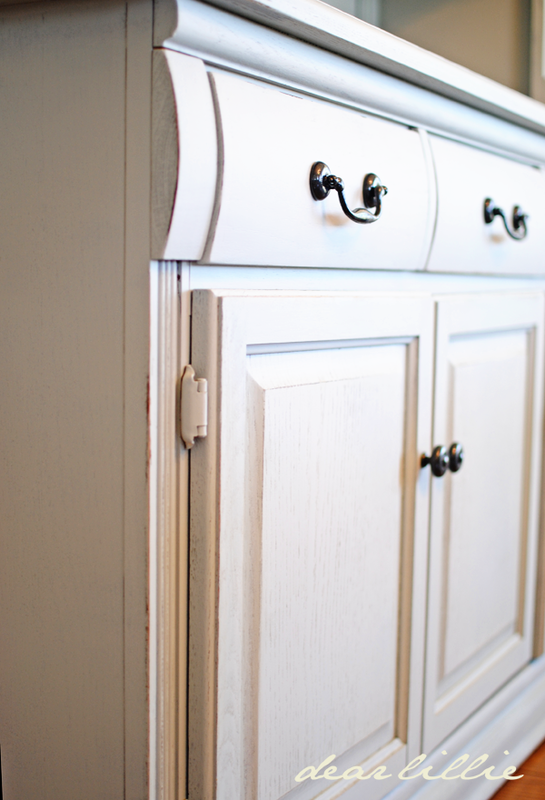 We had planned on replacing the handles and knobs but couldn't find what we were looking for. We decided just to spray paint them for the time being. I have to admit it turned out much better than anticipated so who knows if we will ever bother replacing them now! Then for the upper doors we used basic chicken wire. That might be my favorite part. I have to say this is by far my favorite furniture project to date. My mom was very supportive of this project but I am pretty sure my dad was hyperventilating every moment of the process. I think now that it is finished he's okay with it - or at least I hope - haha! I can't wait to show you the whole piece along with the table once they are in the new house. 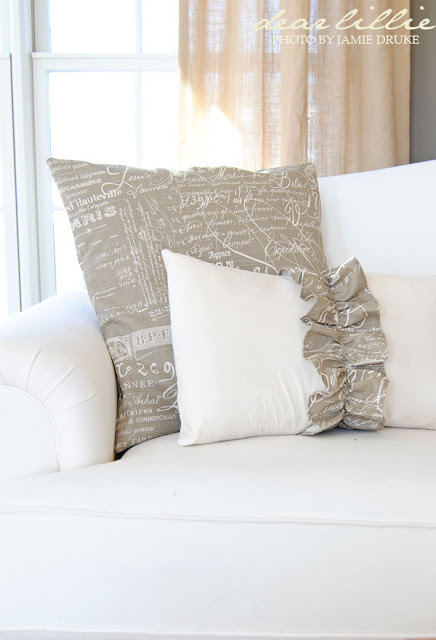 Also, the Reagan Ruffle pillow is back in stock! 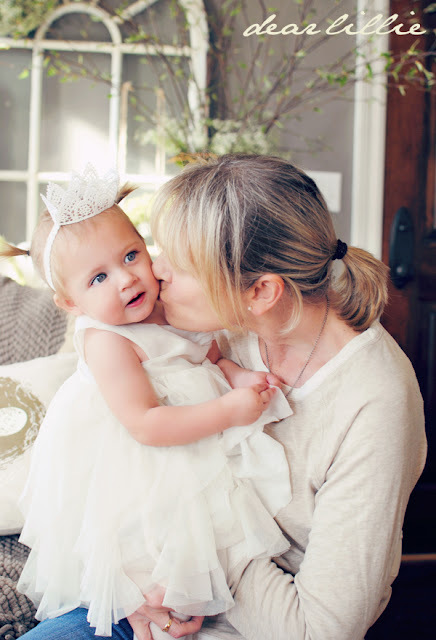 I hope all of you had a wonderful Mother's Day yesterday and have a fabulous week ahead! Very pretty. The wire adds such charm to the piece and I am a big fan of spray painting handles to give them new life. Beautiful makeover! The hutch looks amazing. I just love this makeover, good jobs, I always enjoy looking at your photos. WOW Jennifer LOVE LOVE this makeover!! Did you replace the mirror with a wood panel or just paint over it? Hi Martina - I was lazy, I just painted right over it! :) I'm glad I didn't waste the time replacing it; it covered easily! That looks great. Love the chicken wire added. Get. OUT! This looks fantastic!! 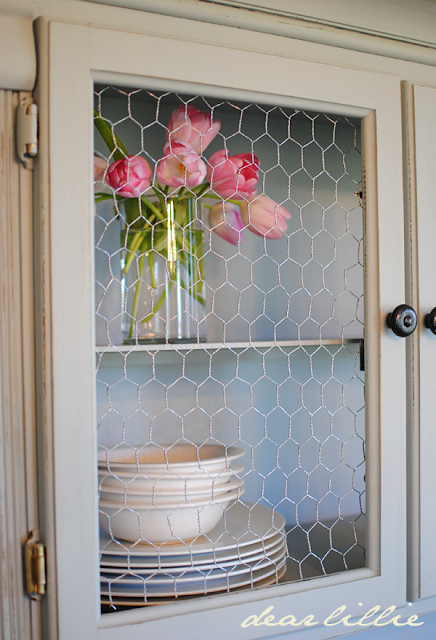 Love the color and the addition of the chicken wire. Love it so much! What shade of white is the BM Sea Haze??? It's actually kind of a gray with a hint of greenish blue in it. It's so hard to tell in these pictures because of the lighting! I hopefully will be able to get better pictures in their new house so you can see the color better! Happy week to you and the sweetpeas! Hello Joan! 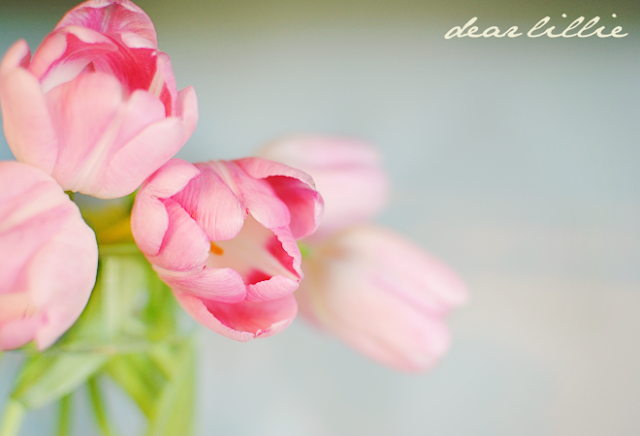 I hope you are doing well! I used the aura line in a matte finish. I was shocked that it went on so easily. 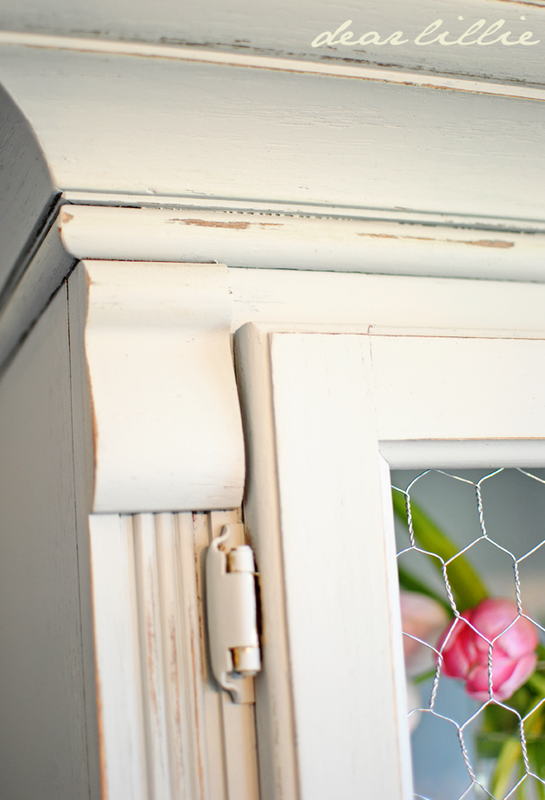 I used the same stuff on a little french cabinet, though, a couple of months ago and had also planned on sanding and priming it first but it went on so amazingly well (and so far has held up perfectly!) so I figured it couldn't hurt to try a little spot on the hutch too to see what happened. When it went on smooth as could be I just kept going. I have used other paint before on similar pieces that has NOT held up so well. The Aura stuff though in the matte finish so far has been amazing. I also used it on my coffee table and side table in my living room and although I did sand and strip the tops of both of those I didn't do anything to the rest of them and just painted right those as well. I did use a wax paste on the top of the hutch to protect it but that's about it. Love it! We had a custom oak table & chairs made in the early 90s then purchased an oak buffet in 97(much like the bottom of your parents' hutch only slightly more ornate). 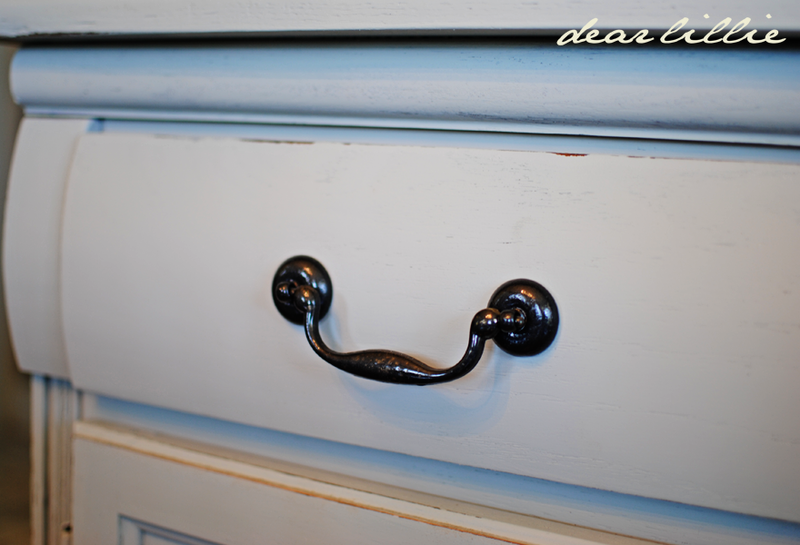 I've been tempted many times to replace the buffet with a re-purposed dresser, but lately I've been leaning toward painting it...it is solid oak, after all - can't beat the quality of the construction! 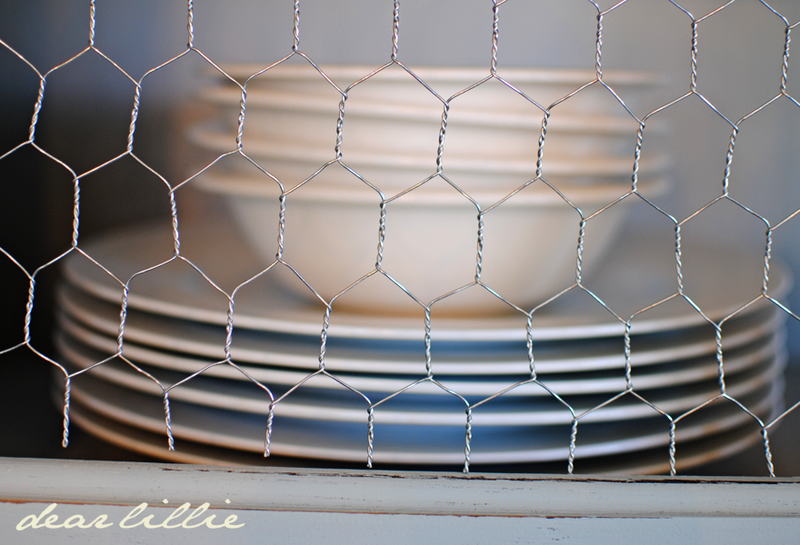 Love love love the chicken wire!! My mom had a tv stand when I was growing up that had chicken wire covering the cabinet doors, and I've never stopped loving it! Your makeover looks great! What a beautiful hutch makeover! I love it! You would never know those were the dated white ceramic knobs, I actually love how they look painted! Thanks for the inspiration, I am hoping to paint my hutch soon. That is an amazing makeover! You guys did a wonderful job. Looks great! 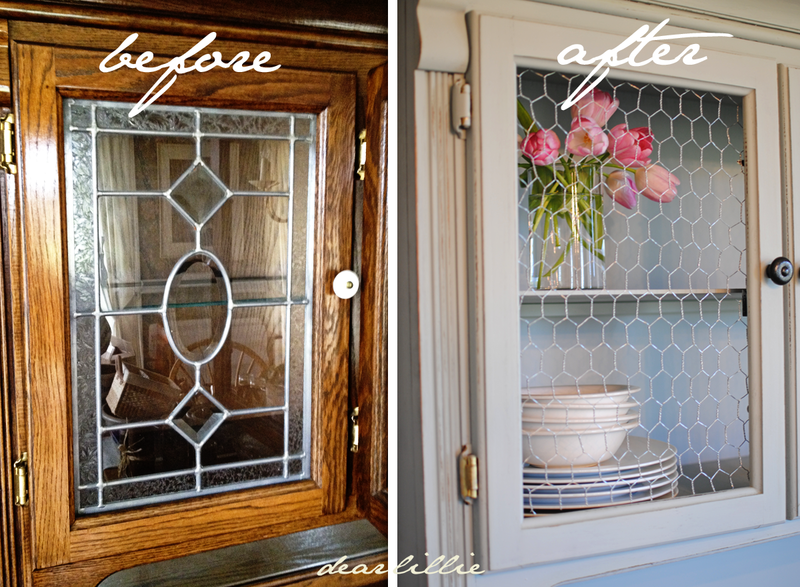 My china cabinet is on my list of things to makeover but it's such a huge project that it keeps getting pushed down the list. Someday! A million times better...great job! Beautiful fresh update. Great job! Can't wait to see your parents new home. And if you help decorate it... I can only imagine how amazing it will be! Now THAT is a remarkable transformation! It's gorgeous! Lovely color. You did an amazing transformation! I bet your Dad loved it once you were all finished with it. I hope you and your Mom had a Happy Mother's Day. The hutch looks fabulous!! I love the chicken wire,and i love that style hutch. My parents have a nearly identical hutch, the glass is the same. I can't believe how much better it looks painted, great job. Beautiful piece love that you just painted right over the mirror! I too was wondering about why you didn't have to prep the piece. I have a large hutch like this one and would LOVE to be able to paint without all that prep!! It is just gorgeous, you did an amazing job! I don't know why all men are against painting wood.... my husband feels the same way.....but I just paint it anyway! Lol.... hutch looks great I just did one too!! Well done, the hutch looks so great. I want one. Gorgeous! Would you please come to Vermont (probably not far from your parents ;) and paint my bedroom furniture this same color? And decorate the rest of my house? Please? I love the makeover! How beautiful! Love what you did! Love the makeover and love the color! Thanks for sharing, Jennifer! So loving the chicken wire, just amazing and your scripture choice too!! Crazy love! Oh my gosh! You painted right over the mirror... you're a girl after my own heart, you'll paint anything! 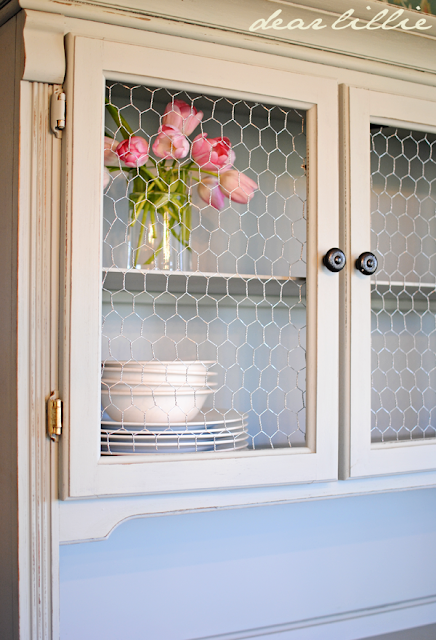 It's already a thousand times better... i'm loving the chicken wire, and what a great color. I'll have to remember that one, it's almost a gray, blue, soft sea glass green all at the same time. You guys are amazing with the whole decorating stuff... i wish i could drag you to my house for a day! Wow! That is gorgeous, Jenni! When Ben gets a little older and I have more time, I'd like to paint mine in the kitchen. It has a polyurethane coat right now. Do you think I would need to sand a little first? Also, love the tulips and Bible verse - reminds me of a sweet story about Blake. I didn't sand this one so if you use the BM Aura stuff in the Matte finish I don't think you will need to either. I miss little Ben! (And Abby, Luke, Robert and Josiah too of course!) You will have to tell me the story about Blake next time I am home. Love you! This hutch is AMAZING. 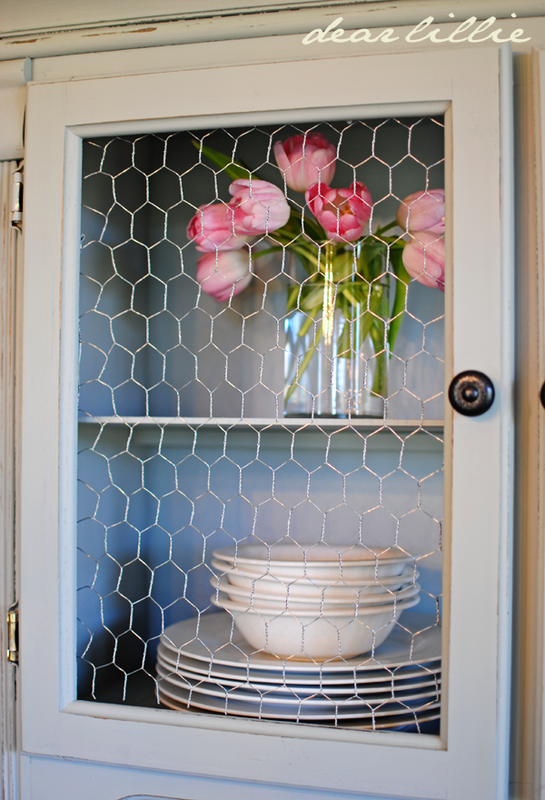 I love the country feel of it - I've been wanting to do something with chicken wire forever! Thanks for sharing :) Awesome job! Jenni, I nearly hyperventilated looking at the pictures!! WOW--what a beautiful, wonderful transformation! This was inspired. Really. Love it!!! Did you use a sander to scuff the edges or do it bu hand? I can't wait to see the rest! Thanks! I did it by hand for this piece! 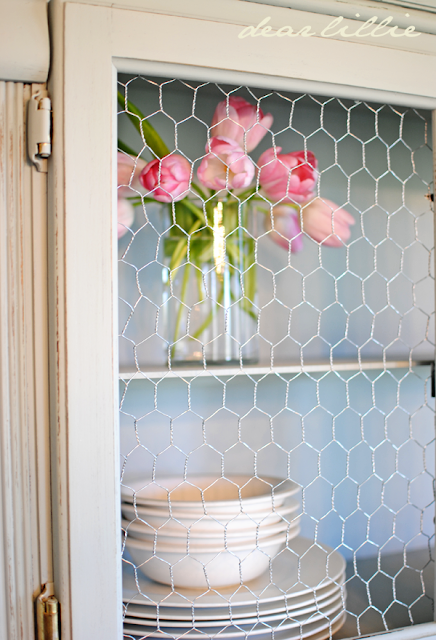 Hello, was thinking of adding chicken wire to a bookshelf I have that has cabinets at the bottom. Where did you get your wire from? I got it at WW Building Supply in Newfane, VT, but you could probably get it at any building supply store like Lowe's or Home Depot. Seriously spectacular!! I've been wanting to add chicken wire to a piece and have been keeping an eye out for the right one. I have to say I would've ignored a piece that looked like your "before" until now! Thanks for showing me the potential in a dated cabinet! Love it!! I have a desk that has been sitting in my garage now for 4 years getting ready for me to paint. 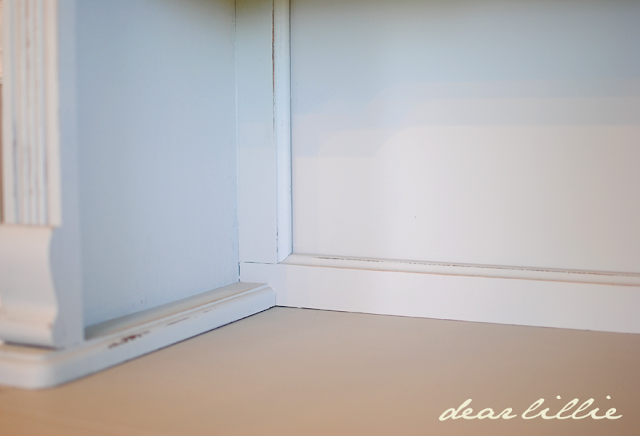 I love the color sea haze you used on the hutch. Would that color go well with my walls that are painted with Sherwin Williams whole wheat color? Thanks Lillie, we love your style. Yes, I think it would look beautiful! 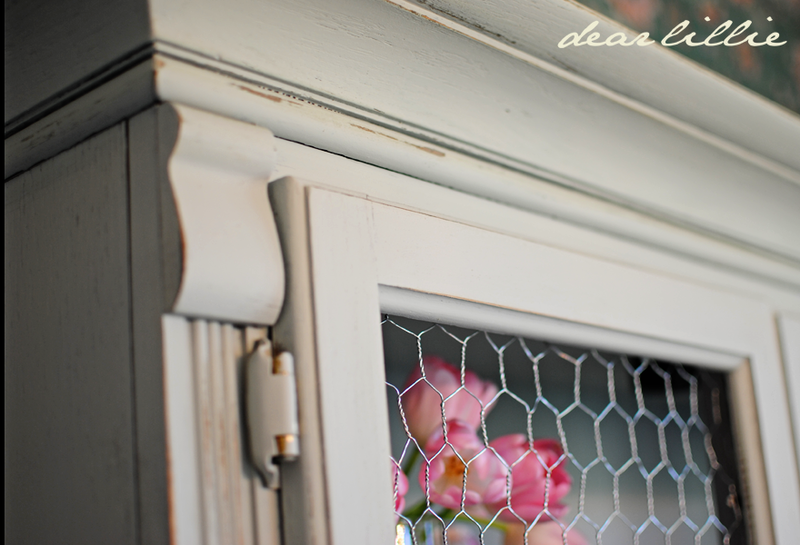 HI, did you use Annie Sloan Chalk paint? If so, what color? Also, what spray paint did you use for your knobs?? thanks for your help!! I am so inspired!!!! Thanks! As mentioned in the post we used Benjamin Moore's Sea Haze. It's been a while so I can't remember the brand for the spray paint. =( I think I got it at Home Depot, though, if that helps. Found this while researching replacing or painting over mirrors. One question, did you use a brush or a roller for painting both hutch and mirror? It looks great. Both - I used a roller wherever I could and used a brush on the rest. Have a blessed weekend and beautiful holiday season! Could you tell me if that hutch is solid or laminate? I have a 90's oak laminate hutch that I want to paint but am not sure whether to sand it first. Is there a primer I could buy to skip the sanding process? This hutch is huge, thanks! Hi! It is solid. If you want to avoid priming/sanding I would recommend using chalk paint! Do you have any pics of the table or full hutch? Unfortunately I don't believe we have posted on the other side of their dining room. Thank you for letting me know. 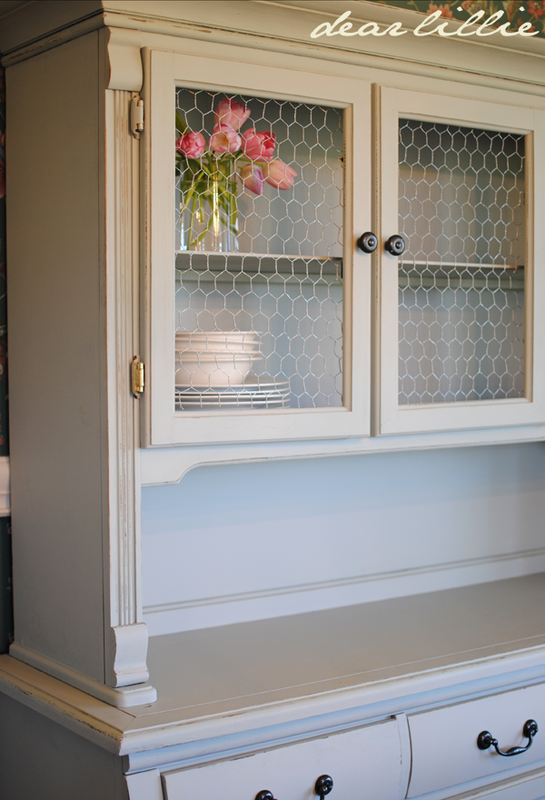 We are so inspired after seeing what you did with this hutch. We've got almost the same exact one and are so thankful for the 'permission' to remove the glass 😄. Too bad about the table pic, but thank you very much. Beautiful! Sorry if you've already answered this question. How did you replace the stain glass with the chicken wire exactly? This piece was my inspiration piece. Now I'm trying to find the drawer pulls and knobs. Any idea where you got them? I'm also interested in your method of replacing the glass with the chicken wire. Mine didn't come out so well.